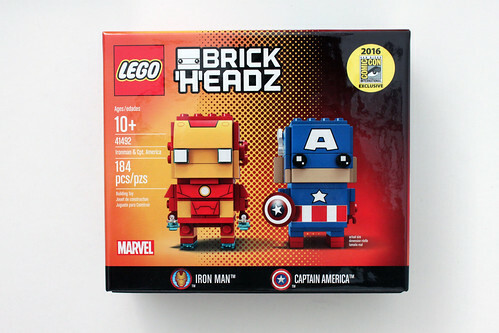 This year’s exclusive sets at San Diego Comic Con are the new LEGO BrickHeadz which are also coming in 2017. These sets went for $40 each at the con and the only way to be able to get one was to enter a raffle early in the morning to win a voucher to purchase the set later on in the day. 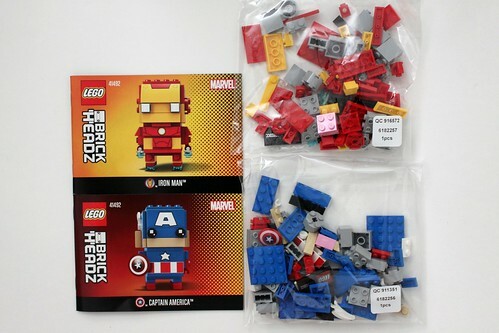 The only BrickHeadz set that I was able to obtain is Iron Man & Captain America (41492) which contains 184 pieces. 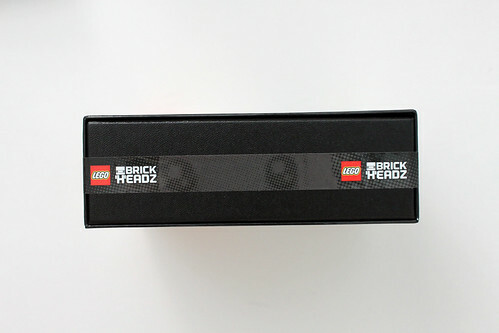 If these BrickHeadz sets look familiar, they somewhat resemble the LEGO CubeDudes created by Angus MacLane for SDCC 2010 and Star Wars Fan Celebration V.
Like with other LEGO San Diego Comic Con exclusive sets, the box is of a higher cardboard quality. 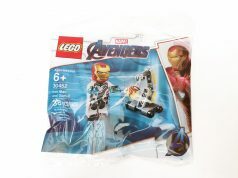 It comes with a slip cover that is taped on the bottom and numbered on the sides. 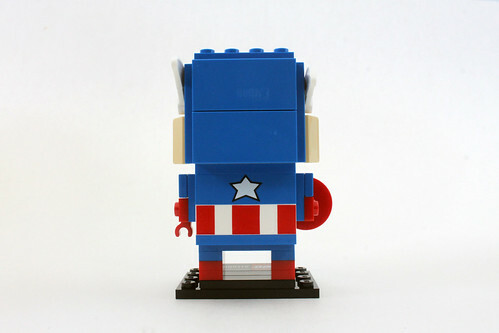 Each side of the box gives a profile shot of each character in the set. 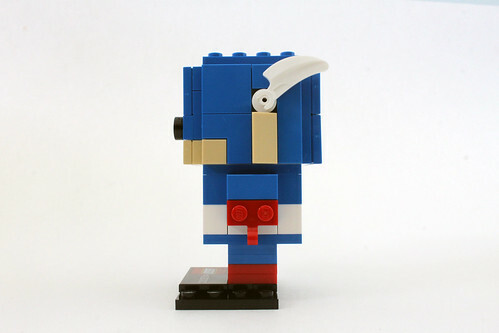 The top gives a top-down view of the BrickHeadz while the sides show one side of the character and the back shows the back side of the build. 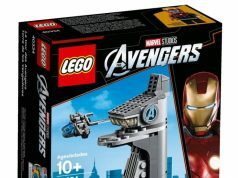 The contents of the box include two sealable bags of parts and two instruction booklets. 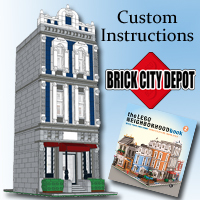 Each of the two builds come with their own instruction booket. 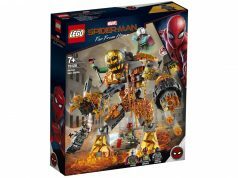 The front pages shows the Marvel side of the exclusive BrickHeadz sets with the other one being Black Panther & Dr. Strange (41493). 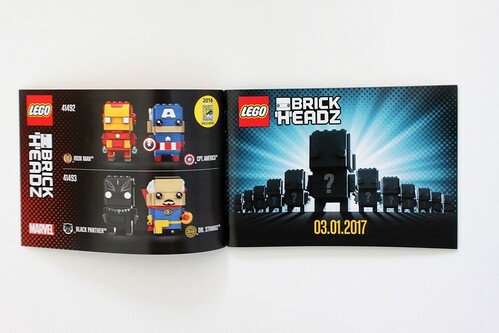 The opposite page shows a silhouette of general looking BrickHeadz with the release date of March 1, 2017. 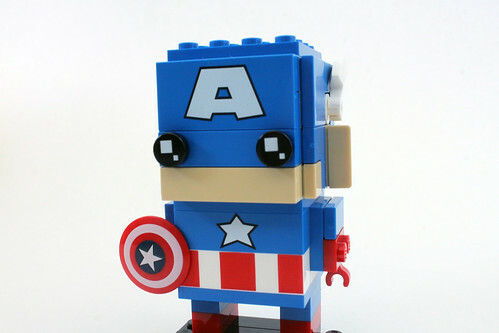 The first part of the build is Captain America. The build starts with the body and the arms. 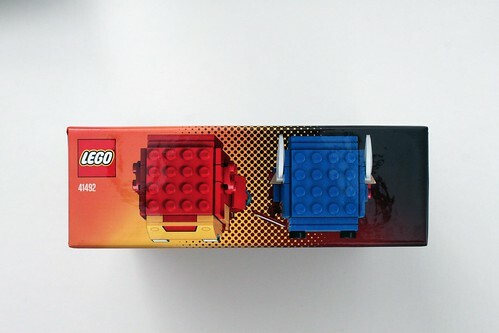 Here you get some nice printed 1×4 bricks of the star and the belt. Next is the head with a 2×4 tile of the “A” on the mask. The eyes are also some new printed 1×1 round tiles with the pupils. The wings on the side of the mask are made of white claw pieces connected to a new white peg piece. 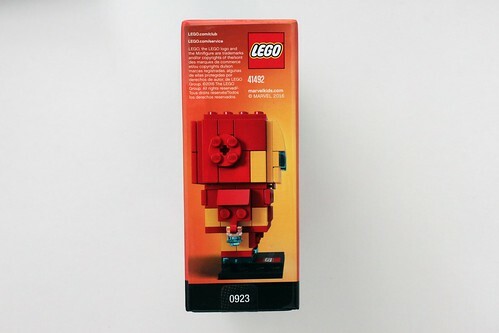 The last part of the build are the legs which are just some 1×2 plates stacked on top of each other. 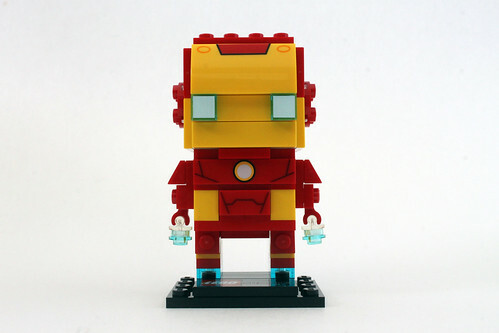 Finally, he stands on a 4×6 plate with an exclusive printed 2×4 tile. 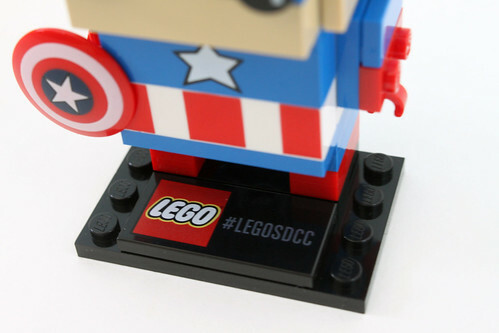 The tile has the LEGO logo and the hashtag #LEGOSDCC. 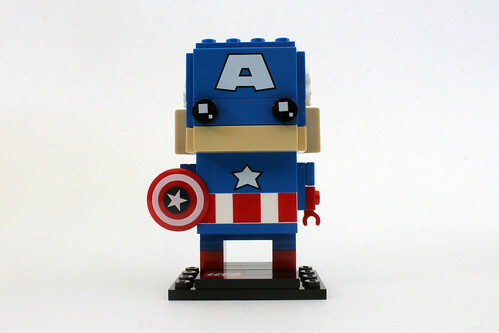 His accessory is the standard shield we’ve seen for the Captain America minifigures. 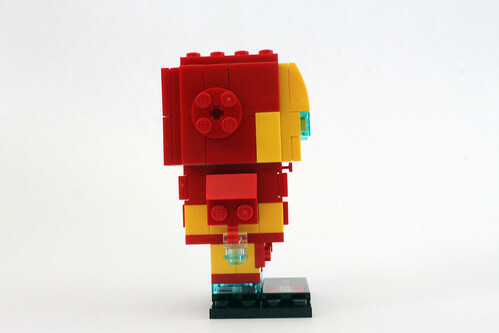 The other build is Iron Man built in a similar fashion. 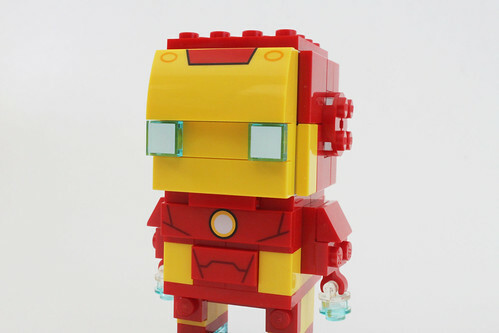 On his body, there are some printed tiles of his suit on the front. The arms hold on to the newly released trans-clear stud with bar piece and a trans-blue stud to represent the repulsors. 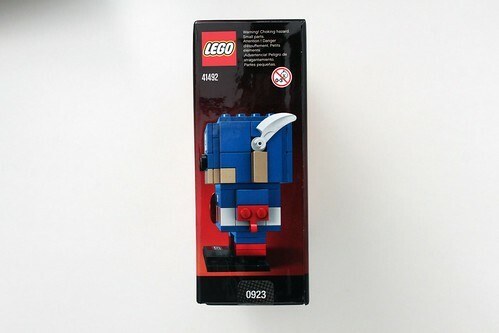 The head also has some printed pieces with a slope piece for the top of the mask and 1×1 trans-blue tiles for the eyes. The legs have a bit more building to it instead of stacking plates together. 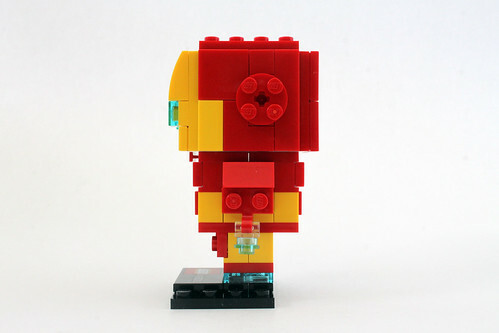 Iron Man also has the same stand that Captain America has with the exclusive printed LEGO SDCC tile. 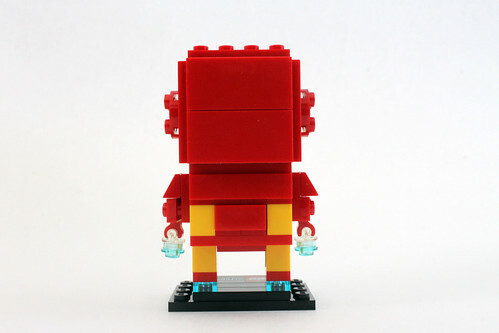 Overall, the LEGO Marvel BrickHeadz Iron Man & Captain America (41492) is an okay set. 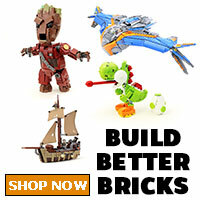 There’s nothing to complicated about the building aspect of the set as it is mostly just brick stacking. 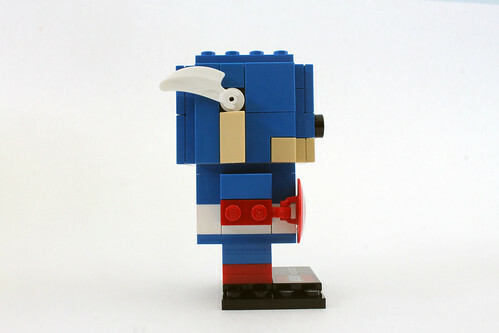 The heads are built using 1X2X1 bricks with studs on the side to give the SNOT look. What I really like about the sets are the amount of printed pieces for both characters. 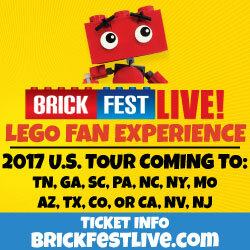 Whether the LEGO BrickHeadz sets coming out in 2017 with have printed parts or not remains to be seen. 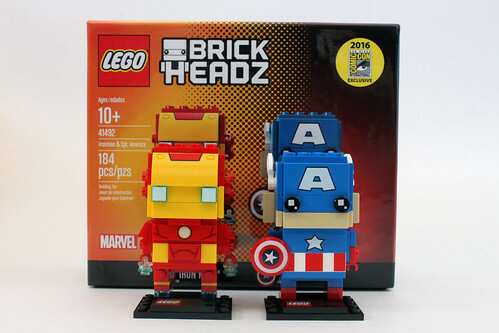 When completed, the BrickHeadz do make cute display builds for your desk or whatnot. 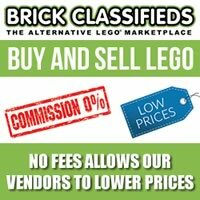 As far as the LEGO BrickHeadz sets being San Diego Comic Con 2016 exclusives go, they don’t have the flair that previous year’s exclusives had like the DC Comics Action Comics #1 Superman set or the Batman Classic TV Series Batmobile and as a result, they aren’t as highly sought after and don’t demand the higher prices on eBay like the others. Do they deserve the $40 price tag that was asked for them? Probably not, especially the work you had to put in to be able to purchase the sets meaning standing in the sun for at least a few hours for a chance to win the voucher. Plus the weather in San Diego wasn’t kind at all the past week since it was hot and muggy even in the early mornings when the raffles were held. 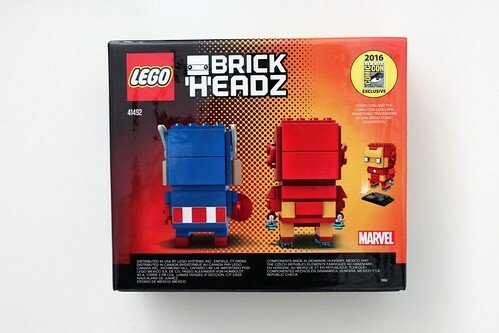 So far we don’t know if the general release of the LEGO BrickHeadz will be single figures or be in packs or even these same characters from SDCC. The pricing will most likely be lower as these price points are usually for SDCC exclusives. March 2017 is still pretty far away but hopefully we get to see more about them as we get closer to the release.